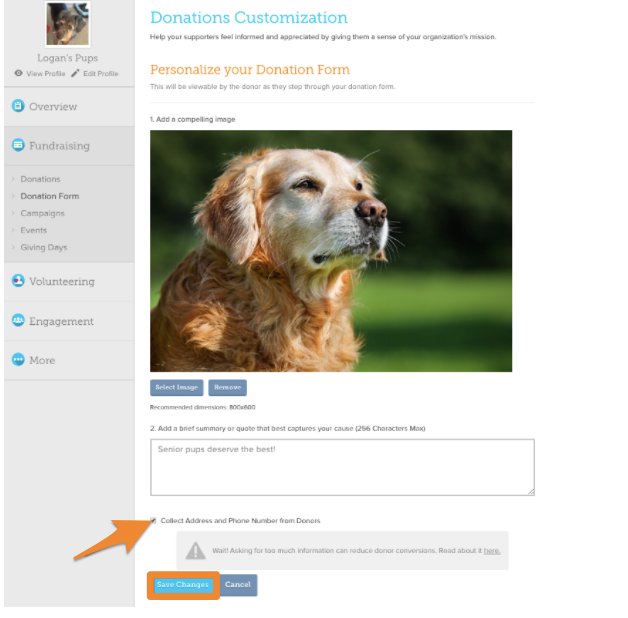 From your admin dashboard, expand the "Fundraising Tab" and select "Donation Form" from the drop down menu. Under the "Personalize your Donation Form" section, check the box that says "Collect Address and Phone Number from Donors" then click the "Save Changes" button. Once you click "Save Changes" your donors will automatically be required to add their address and phone number when making a general donation to your organization on GiveGab. Once this option is selected, all future donations to your organization will require phone numbers and addresses from your donors, and include this information in your donation report.